Free Shipping Included! Burkley Case Full Leather Ultra Slim Snap-on Case for Apple iPhone 8/7 | Everyday Luxury Leather Case | Floater Black by Burkley Case at All Company Mobiles. MPN: B01MS8FJYC. Hurry! Limited time offer. Offer valid only while supplies last. Our Burkley artisans designed this case with you in mind. With this case your brand new Apple iPhone 8 / 7 will emit an unmistakable air of class. Our Burkley artisans designed this case with you in mind. 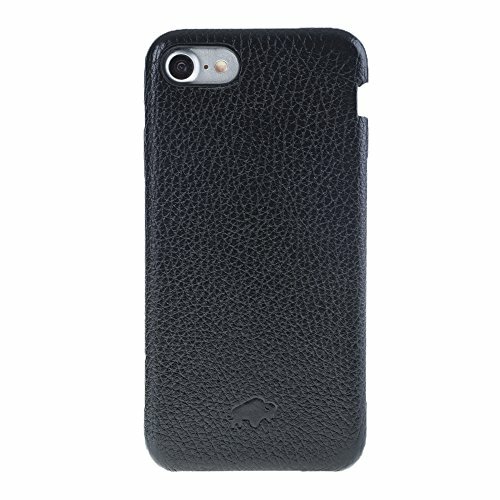 With this case your brand new Apple iPhone 8 / 7 will emit an unmistakable air of class. This sleek handcrafted leather covers inside and outside the case completely and cradles your phone perfectly. Easy to put on and take off, this case allows you easy access to all ports as well. Stylish, highly practical and just what you are looking for. Burkley's Full Leather Cover Snap-on Case boats a timeless, classy aesthetic that will protect your brand new Apple iPhone 8 / 7 in super sleek style. Handcrafted from rich, high-quality soft grain leather, this durable case boasts an ergonomic design that ensures quality and convenience. The ultra-thin but protective frame provides structure and stability and the interior is also covered with the same high-end full grain leather finish that prevents scratches and smudges. The natural leather exterior provides a final touch of elegance! It's the stylish case you've been dreaming of! The snug fit in the inner shell of the phone case holds your smartphone safe. Easy access to charging and earphone ports. There is also an ultra thin backbone made with hard Policarbonate. The lightweight frame provides structure, stability and safety. This product is 100% perfect fit for Apple iPhone 8 / 7. HANDMADE LEATHER | Handcrafted from rich, high-quality soft grain leather, this durable case boasts an ergonomic design that ensures quality and convenience. DESIGN | This sleek handcrafted leather covers inside and outside the case completely and cradles your phone perfectly. The ultra-thin but protective frame provides structure and stability and the interior is also covered with the same high-end full grain leather finish that prevents scratches and smudges. LIGHTWEIGHT FRAME | The lightweight frame provides structure, stability and safety. EASY ACCESS | There is easy access to charging and earphone ports. THIS CASE FITS ONLY IPHONE 8 / IPHONE 7. WARRANTY | IS 30 DAY MONEY BACK GUARANTEE. If you have any questions about this product by Burkley Case, contact us by completing and submitting the form below. If you are looking for a specif part number, please include it with your message.